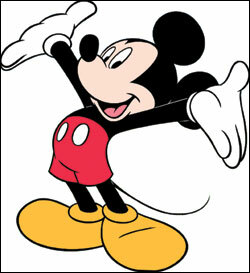 Mickey Mouse celebrates his 80th birthday today. The much loved Walt Disney character first graced the screens on this day in 1928 in the black and white cartoon Steamboat Willie, where he was voiced by Walt himself. The cartoon character has undergone many changes since his debut, often representing the mood in America at the time. Said to have been Walt Disney’s favourite of all the characters, the infamous mouse could have been very different. Walt was originally animating a rabbit called Oswald when he lost the rights to it. He quickly had to come up with a new character and decided on a mouse, although it was his wife Lillian who convinced him not to name him Mortimer as planned. It was not long after that Disney released the hugely successful Steamboat Willie, the first ever cartoon to use synchronised sound. Nowadays Mickey is instantly recognisable in his red shorts, white gloves and yellow shoes. His love interest Minnie Mouse is never far from his side either and has co-starred with him in many of his screen outings. Walt Disney revealed in 1933 that the couple enjoyed an off-screen relationship as well as on, and were in fact married. Mickey has not starred in a film for over twenty years, although he does make regular appearances at the many Walt Disney World theme parks around the world. Walt died in 1966 after battling lung cancer, just years before the opening of the first Walt Disney World Resort in Florida. Posted in Entertainment and tagged Mickey Mouse, Walt Disney. Bookmark the permalink. A Jaffa Cake Just As Healthy As An Orange?